Today I wanted to touch on something I’m surprised I haven’t thoroughly gone through before. I think it’s an absolute necessity for anyone to know, and it really forms the basis of where healthy eating can begin – in the grocery store. And no, I’m not talking about MyPlate – though that’s an excellent tool as well. What I’m talking about are Nutrition Facts Panels aka those things on the box of food that few people ever bother to read, or simply don’t know how to. But that’s ok – today I’m here to show you how! 1. Begin Here: SERVING SIZE. Every time you look at a nutrition label – which you should be doing every time you pick up a package – your eyes should automatically go here! Not only does it tell you the serving size, but it gives you an idea of how many servings are in each package. So, if you fall prey to scarfing down an entire bag of chips or box of cookies, you can figure out how many calories you’ve just consumed simply by multiplying. For example, if you consumed this entire package you would multiply the calories, etc. by two! 2. Next: CALORIES. The non-complicated version of losing weight is basically calories in < calories out. Now you may not be tracking calories or really paying attention to them, and that’s fine. I don’t suggest that you should live your life by your calorie count, but at least glancing at it can give you useful information to keep yourself on track. 3. Things to Reduce: The next region includes Total Fat, Saturated Fat, Trans Fat, Cholesterol, Sodium. Or, things you should avoid having in excess. Special RED ALERT on this package: Trans fat! You should hardly ever be consuming it! 4 & 5. Things to Make Sure You’re Getting Enough Of: This particular region includes Fiber, Vitamins & Minerals. So basically, the things you need to make sure you’re getting a good quantity of. Vitamins A, C, Calcium, and Iron are required to be printed on the nutrition label, but some companies will include more if it seems favorable to their product. 6. Handy Tool: FOOTNOTE. This is a general guide of how much of each macro or micro-nutrient you should consume if you’re eating a 2000 or 2500 calorie diet. While useful, it’s not applicable to everyone. However, you can use it as a way to ballpark values that may specifically fit how you eat. **Ingredients List: I would vouch for this being the most important part of a nutrition label. As I’ve touted before, aim to eat as minimally processed as possible and you’re probably doing better than you think! That being said, if your ingredients list is over, say, ten ingredients long – drop that package! I’d even strive for less than that, but do what’s reasonable for you. Additionally, if that list is a mumbo jumbo of unrecognizable ingredients – sprint from that package! These are all chemicals and additives that are used to preserve shelf life or enhance color, etc. to make the product more appealing to the consumer. 7. Important Note to Consider: There’s Daily Values beside each listing on the nutrition facts panel. Now these are percentages of your 2000 calorie diet, but they’re handy to have as a tool to make short work of figuring out if something is “high” in a certain nutrient, or “low”. The standard rule of thumb is usually if something is <5% that would be considered low, while something 20% or higher would be considered high. I hope this little guide was helpful! 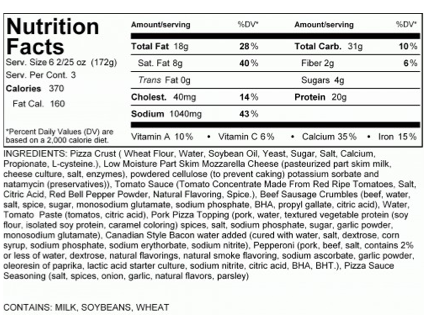 I strongly believe people’s ability to read a nutrition label is key to making healthier choices at the grocery stores, restaurants, etc. All of the information is right there and it’s up to dietitians to help the consumer interpret it all, so I hope I’m doing my job 😉 Just remember: look at your serving size and pay attention to those ingredients lists! Now for a little added humor/scariness – can you imagine if this happened? 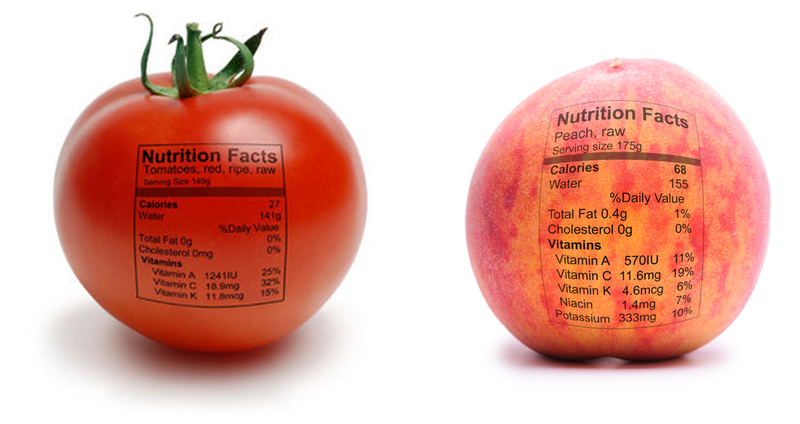 Nutrition facts panels on fruits and vegetables? 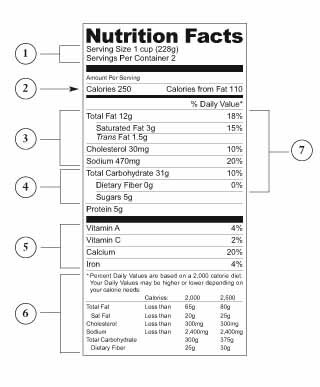 Image Credit: all were from Google Image searches and then edited to show specific portions of the nutrition facts panel by me. « All the Granola Bars!